JACKSON, Andrew (1767-1845): Seventh president of the United States (1829-1837), born in Waxhaw, South Carolina. Trained as a lawyer, elected to Congress (1796) and to the Senate (1797) for Tennessee, and later served as Supreme Court judge in that state (1798-1804). During the war of 1812, he served as commander of the South and secured his military fame through campaigns against the Creek Indians and a victory over the British at New Orleans (1815). Document Signed as President “Andrew Jackson” and counter signed by Secretary of State “John Forsyth” and Attorney General B.F Butler. 11” x 15”, in frame. The patent is issued to John Thompson 3rd, “for improvement in the machine for picking curled hair,” (used for stuffing mattresses and furniture), City of Washington, July 8, 1834. 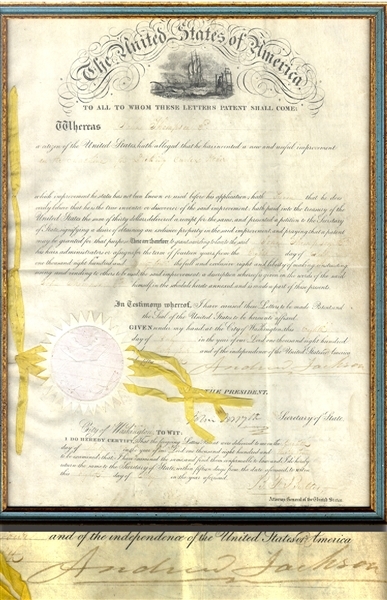 Complete seal and ribbon present, signatures are firm, manuscript otherwise slightly light.